Flow Proportional Control - An external 4-20mA DC signal is connected to the feeder. Chemical feed is controlled at a rate that is proportional to the incoming signal. 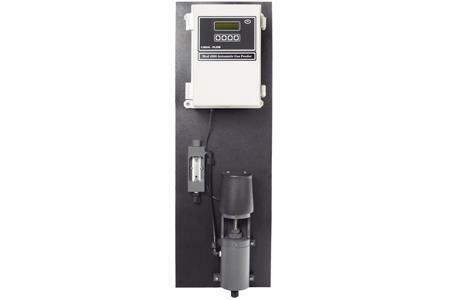 Dosage control is available to adjust the feeder output 0.2 to 4.0 ratio. Residual Control - An external 4-20mA DC signal from a residual analyzer is connected to the feeder. Chemical feed is controlled via the setup menu in the residual mode. Parameters, such as sample lag and target residual, are entered in the controller for responsive control. Compound Loop Control - External 4-20mA DC signals from both flow meter and residual analyzer are connected to the feeder. Chemical feed is controlled via the setup menu in the compound loop mode. Parameters such as sample lag, target residual and flow over-ride are entered in the Model 4200EC Controller for responsive control.